Oddy, Nicholas (2011) THE ROADSTER’S END. In: Travel Identities, 20 and 21 September 2011, University of Lancaster. The style of bicycle termed ‘roadster’ has its origins in the period of the high bicycle, but its current definition comes from its use to describe road-going machines in the early 20th century. The type-form was the most versatile of its time and was favoured by almost all but riders involved in competitive sport. High framed on 28 inch wheels and usually black, its ubiquity made its riders hard to define. 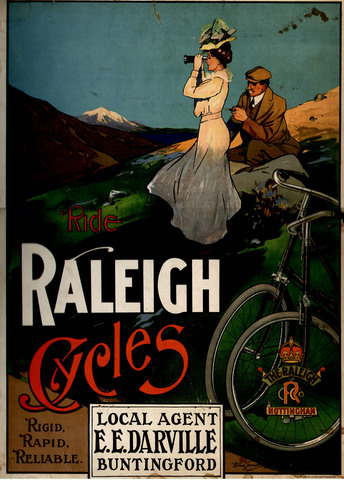 This was to change in the inter-war period as ‘serious’ cyclists began to favour ‘lightweights’, which visually distanced their riders from others. From then on cycling identities began to fragment round the style of machine being ridden, a process that continues today with an ever expanding range of cycling identities that are expressed through machine type. This paper sets out to explore the factors that encouraged this fragmentation and its affect on the identity of travel by bicycle.